Why is the Resurrection so important? Why not just focus on Jesus as an exemplary moral teacher? How can Christians have any confidence in the historicity of the Gospels? Now, when I first sat down to answer her, I spent a good 2 hours writing, only to realize that what I had written wasn’t really an answer to these questions: I had jumped forward to discussing an ontology of the Resurrection, bypassing her more existential and historical questions. So I’m going to roll that work into a second post, and here try to hone in on what Dianne is getting at. In response to her first question, why the Resurrection is important above and beyond simply appreciating Jesus’ ethical teachings, it seems to me the central answer is this: if Jesus was just an ethical teacher who got in trouble for those teachings and then killed, why should we listen to him? He might have been smart, kind, wise, and committed, but it’s arguable that an ethical system that gets you killed is not an ethical system one should follow. If Christianity ends on Good Friday–if there’s never an Easter Sunday–then the Gospels should be a cautionary tale: “don’t try this at home kids, you’ll get crucified.” It’s only in light of the Resurrection that we can say with confidence and hope, that though you very well might get crucified, in the end those who accept crucifixion in service of justice and truth are vindicated. Whether this passage reflects a historical event or not, it communicates a clear truth: without understanding Jesus as having been victorious despite his death, it seems unlikely that the community around him would have blossomed the way it did in the decades after he died. Furthermore, it’s important to remember how many of Jesus’ teachings weren’t a collection of easy ethical injunctions. He certainly insisted that we not judge one another, that we care for the poor and marginalized, and that love should be our guiding ethic. But he also spoke about a final judgement, about the need to take up one’s cross, and about the mysterious kingdom of God. Jesus was not just an ethical teacher. He was as interested in what we today would call mysticism and teleology as he was about social justice, precisely because he recognized that any real ethics had to be holistic: it couldn’t be, on the one hand, a bunch of feel-good, sentimental platitudes, nor could it function as a hard-headed utilitarian pragmatism. Only a view of the world that radically recognized the reality of God and our relationship with God could yield a lifestyle that would be transformative–both for society and the individual. A Jesus relegated only to ethics lessons is a Jesus stripped of much–most–of what he was really concerned with. This is my central complaint against liberal theology: in an attempt to strip the Gospels of their more mysterious, challenging, ‘supernatural’ elements, liberal theology yields a ghostly apparition of Christ–and, importantly, one who is, conveniently, well suited for a secular, capitalist age. But I don’t think this reflects the reality of Jesus’ life and ministry. Efforts to build a view of Jesus in this vein, like the work of the Jesus Seminar, are often couched in terms of reclaiming the “real” Jesus. But like so much else, this effort seems blind to its own biases. 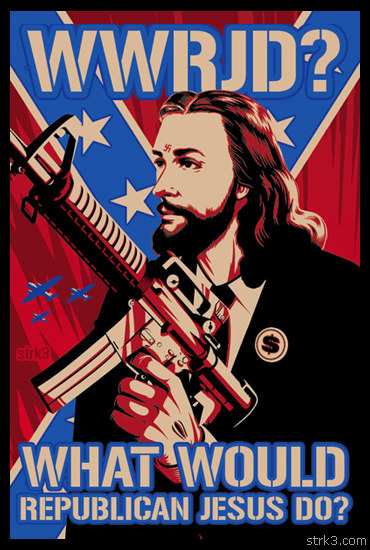 Those who wish to see Jesus as an irreligious ethics professor–surprise, surprise!–find just such a Jesus, just as those who wish to see Jesus as a gun-toting homophobic racist somehow manage to twist him into that as well. Placing the Resurrection at the center of our understanding of Christ is, at its most basic, simply being true to how his friends and disciples understood Jesus after his death. Whatever the Resurrection was, exactly–and I want to point out that asserting it as true doesn’t necessarily mean taking any hardline, specific “empty tomb” position–it was clearly an experience that radically reshaped the lives of Jesus’ community. To refuse the Resurrection its place as a historically real experience–whatever its ontological or scientific veracity–is to rewrite the history of the Christian community. To summarize, what I’m saying here is that our historical understanding of Jesus and Christianity–no matter what our personal opinions on it might be–can never be separated from the communal experience of the Resurrection, because it was precisely that experience that has yielded the texts, ideas, and communities we now pore over and participate in. Addressing what we as modern individuals actually believe about the Resurrection will be the topic of a follow-up post. For now, though, let’s move on to Dianne’s second question. We’ve just now talked about how the whole body of knowledge about Jesus is based on the experience of his Resurrection, that to separate that knowledge from that experience is to alienate that knowledge from the context in which it formed. But this knowledge, these stories about Jesus: what do we know about them? Are they valid sources of information, or just mythical nonsense? Whereas there has (regrettably) been relatively little popular attention paid to the points I raised above, the historicity of the Bible is a totally different animal. For nearly two centuries, this issue has been front and center in theology. As I discussed in my post on liberal theology, it has shaped entire communities and schools of thought. If you really want to delve into this, you’re going to have to look somewhere beyond this blog, because this isn’t my specific area of interest! You’d do well to look up Rudolf Bultmann, Dom Crossan, and NT Wright for a start. The Jesus Seminar, mentioned above, also has a wide range of decorated Bible Scholars (in fact, Crossan works with them). Just searching on Amazon something like “gospels history” or “historicity of the gospels” will yield dozens of books. First off, I’m not a fundamentalist; I don’t think every word of the Bible is literally true–in large part because many of the words in the Bible are meant as allegory, poetry, and metaphor. But even when we look at those sections that do purport to be more directly historical, I’m more than happy to admit the presence of errors–because I worship God, not a book. The number of contradictions and errors are too many to count, really. Did Jesus overturn the tables in the temple at the beginning of his ministry, as in John, or at the end, as in the Synoptics? Was humankind created last, after all the other animals, or first, before them? Genesis chapters 1 and 2 don’t agree. Did the resurrected Christ appear to large bodies of his followers first in Jerusalem, or did he appear instead to disciples in Galilee? We could fill paragraph after paragraph with these questions. But pointing out that a document isn’t 100% accurate in every statement is not the same thing as saying that the document is 100% false. Imagine if that was the bar we set for journalism, or science textbooks. Darwin didn’t understand the concept of punctuated equilibrium, for example. He assumed that evolution always occurred at a steady, even pace. Does that make his whole body of work worthless? Newton, likewise, knew nothing of protons and electrons; was his physics therefore complete bunk? Of course, the Bible isn’t anything like scientific writing, so maybe these aren’t the best comparisons. The Bible is more like history or journalism. But historians are constantly updating and improving their interpretations of historical events. And journalists often report on news with only limited information, piecing things together as best they can, improving their picture of events as more information is available. Should they not do this? Should we not report on events until years after the fact, when we can be 99% certain of every claim made? Furthermore, it’s important to point out that not all claims–in the Bible or in anything else–are of equal weight and importance. Whether Jesus overturned the money changers’ tables at one time, or many months later, doesn’t substantially alter the faith of Christians. Likewise, when the opening chapters of Genesis are understood for what they are–allegorical discussions on the meaning of existence–the radically different pictures given by chapters 1 and 2 can be seen as differing ways of talking about that meaning, rather than conflicting claims about factual events. For the New Testament, much of what is in the Gospels is of a secondary or tertiary nature. When scholars–on either side of the debate–engage in years-long debates on a single word of the text, one can’t help but feel that they are spinning their wheels, wasting time on near trivialities. But there are also, clearly, claims made in the Bible that are of great importance: their truth or falsity radically determines the meaning and validity of Christianity. We might not be too concerned with exactly when and where Jesus was born–but that he was born is clearly crucial. Likewise, whether Jesus delivered the beatitudes on the mount or on the plain doesn’t really affect their meaning–but if he never said anything like them, that’s a whole different issue. And here we come upon another important point. Humans often forget details. But we have exemplary memory for salient facts and experiences. As an example (a good one, at least, for Americans reading this), try to remember September 11, 2001. I imagine you can immediately remember one thing about that day: two planes flying into the World Trade Center. But what did you eat for breakfast? When did you get up? What were you wearing? I, for one, couldn’t tell you the answers to any of these questions. Does that call into question my claim that, in fact, on that day, two planes slammed into the World Trade Center? I don’t imagine anyone would make that argument (unless they were outlining a radically Idealist or solipsist ontology, but that’s a whole ‘nother discussion). So clearly, it’s quite possible that a person–and a community–could retain valid knowledge about some experiences while forgetting lots of other events, or some of the details surrounding those events. And it seems to me that the experience of the Resurrection is just such a salient experience. Whatever else might be said about it, the idea that, because some of the details of the stories about Jesus’ life are in dispute, all claims made by the Bible are therefore bunk, is ridiculous. Of course, this is the very bar that Biblical literalists have set–and it’s really them, not critics outside of the Church–that bear the blame for this line of skepticism, since, as I said, I know of no other text that any secular scholar would hold to this high of a bar. But when we reflect on the differing degree of importance in the various claims, I think we can agree that the writers of the Gospels–and the memories which those writers were recording–don’t stand or fall all together. It’s quite possible that folks remembered certain events well, while remembering others less-so. It’s also important to remember that people will certainly remember events differently precisely because they were in different places, with different backgrounds, when a given event occurred. People living in Galilee would probably point to their experience of the Resurrection–again, whatever it was or wasn’t–as beginning in Galilee, while those in Jerusalem probably remember Christ having appeared there first. That doesn’t call into question the veracity of their claims, it simply recognizes a simple and obvious truth about human experience. Of course, there is also the issue of whether we ought to have any confidence in the claims about the Resurrection itself. For me, this can be divided into two parts: addressing alternate explanations for the experience of the Resurrection, and talking about what exactly it means to speak of ‘the Resurrection’ in the first place. In my next post, I’m going to flop things around and actually address the second issue first. At a later point, I’ll delve into the first question, on alternate explanations–though I should point out that writers much wiser and more knowledgeable than I have already tackled the issue, and I’ll mostly just be summarizing their views, so you could easily search out that work on your own. Dianne, I hope this post shed some light on my thinking on these issues! I know I have, at best, just knocked a tiny chunk out of the very tip of the iceberg, but of course this a blog, not a multi-volume textbook! Thanks again for your thoughtful questions and I look forward to further dialogue! This entry was posted in Christology, History of Theology, Talking About God Series, Theology and tagged historicity of the Gospels, Jesus Seminar by Noisy Gong. Bookmark the permalink. (1) Buddhism seems to be doing okay without a resurrection story. 350 million adherents may not compare to the 2 billion supposed Christians, but it is not a number to be sneezed at, either. I accept the above statements. I don’t see Jesus’s teachings as a check-off list of either “thou shalt nots” nor “thou shalts.” I believe Jesus’s teachings were ultimately about the transformation of which you speak. I believe the same could be said of The Buddha’s teachings, as well. And I suspect that the experience of life lived at that level does not require a resurrection story to “justify” or “sell” itself. I suspect there is no need for a resurrection story for a life at that level. Perhaps a life lived at that level IS a resurrection story? Not about physical death and/or an eternal afterlife in heaven, but here and now in this life? And no, I’m not speaking from personal experience because I’m certainly nowhere near living life at that level, but I suspect you have nudged my personal journey forward a notch or two. That transformed life (and living it in the here and now) is where I want to be (said in extreme fear and trembling!). While it’s true that Buddhism doesn’t have a *resurrection* story, Siddhartha’s account of enlightenment is no less miraculous, as far as I can see. He essentially claimed that through meditation and renunciation, a person could exit the cause-and-effect stream of reality: that one’s subjective self could essentially ‘return’ to the Void of unconditioned being. It’s actually very similar to the resurrection story in that it claims that through spiritual discipline and selflessness, people can overcome the objective boundaries of their lives and escape suffering. So I would actually cite Buddhism as a good comparison for our discussion of Christianity: if you try to strip it down to a ‘pure’ ethical system, I think it loses its essential character. It’s only in light of the transformative hope that the unexpected and miraculous event at the center of them that the systems–Buddhism and Christianity alike–have any claim on us. But as I said in the post, that doesn’t necessarily mean accepting any specific interpretation of the resurrection narrative–just as there have been very different understanding of what the enlightenment/liberation that Siddhartha attained, the resurrection has always been mysterious. I actually have a post in the works that addresses some ways of thinking about the resurrection as modern people; I hope to post it today or tomorrow. Thanks again for your comments and the discussion you’ve started!